Research teams from Karolinska Institutet and Uppsala University have jointly discovered that the usually protective enzyme FBW7 is commonly mutated and inactivated in childhood brain cancers causing tumors to spread and become more difficult to treat. The study, recently published in the scientific journal EMBO Journal, contribute to improving knowledge that is relevant to the development of more effective cancer treatments and future individualized treatment strategies. “We have shown that when FBW7 is functionally inactivated this leads to a block of degradation of the stem cell protein SOX9 which becomes more stable in the brain cancer cells,” said first author Aldwin Suryo Rahmanto at the department of Cell and Molecular Biology. These findings are not unique to childhood brain tumours. 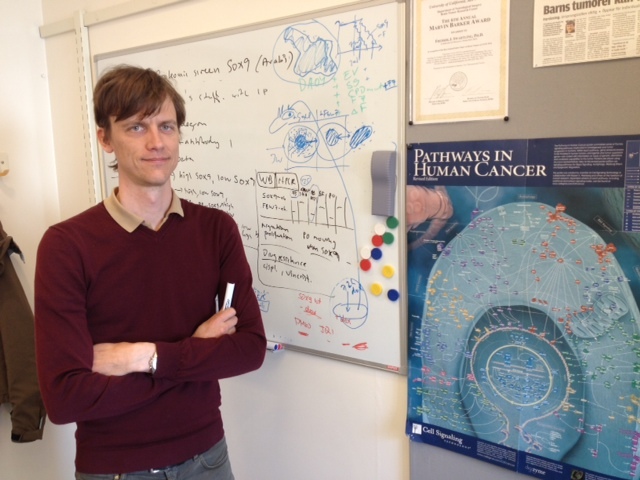 “We believe this is a central mechanism for different types of cancer since an independent research team at the Rutgers Cancer Institute of New Jersey, USA, recently published similar results as ours, but instead in colon, skin and lung tumors,” says Fredrik Swartling, research group leader at Uppsala University and one of the principal investigators of the Swedish study. The researchers examined the protein levels of SOX9 in malignant childhood brain tumours from more than 140 patients together with scientists in Germany. They found that tumours with increased levels of SOX9 more easily metastasise. In laboratory experiments the researchers mimicked the way SOX9 is stabilised in brain tumour cells and showed that SOX9 turned on 40 to 50 genes in the tumour to make it more resistant to standard treatment with cytotoxic drugs and more prone to spread. “We also identified a way to de-stabilize the SOX9 protein by treating the brain cancer cells with small molecular drugs, which made them less resistant to chemotherapy again,” says Olle Sangfelt, the other principal investigator of the study and research group leader at Karolinska Institutet. At the molecular level, tumours from different patients are often quite diverge, even though they belong to the same type of cancer. Certain childhood brain tumours have for instance high levels of SOX9 whereas others have relatively low levels. If it would be possible to identify tumours that have an aberrantly stabilised SOX9 protein, the drugs tested in this study could be used to prevent tumour spread in these patients and improve their response to standard chemotherapy.